In his PhD thesis from 1873, Johannes van der Waals devised a theoretical framework to describe the gas and liquid phases of a molecular ensemble and the phase transition from one to the other. That work resulted in the celebrated equation of state bearing his name. To this day, the van der Waals theory is still the prevailing picture in most physicists’ minds to explain the emergence of the liquid state. It asserts that the liquid state arises at high densities from an equilibrium between attractive interatomic forces and short-range repulsion. Now, a new type of liquid has emerged in ultracold, extremely dilute atomic systems for which the van der Waals model does not predict a liquid phase. 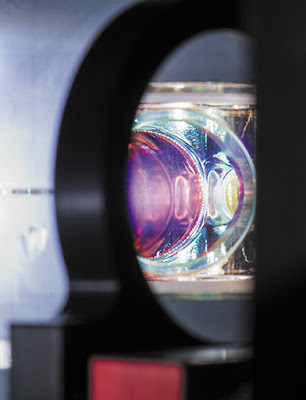 Using the tools of laser cooling and trapping, experimenters can reach the ultracold regime to create atomic quantum gases.1 Quantum interference effects between atoms are an important part of the statistical descriptions of those systems. However, if a monatomic ensemble is simply cooled, any chemical species will form a liquid instead of a gas due to van der Waals forces and the system will never reach the quantum regime. So to see quantum effects, the classical liquid state must be avoided. That requires extremely low densities that keep the distances between atoms much larger than the range of attractive forces that would bind the liquid. But keeping the atoms far apart traps them in a dilute, metastable state. A whole new mechanism is needed for atoms in such dilute conditions to form a liquid phase. Igor Ferrier-Barbut is a researcher at the Institut d’Optique and CNRS in Palaiseau, France.